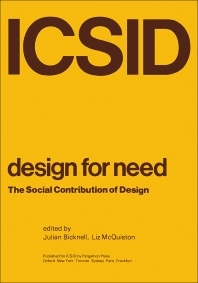 Design for Need: The Social Contribution of Design compiles papers presented at the Symposium at the Royal College of Art, London in April 1976. This book focuses on the concept of design as a conditioning, reformist, and practical element in society, which examines and demonstrates actual projects carried out in response to social needs. The topics discussed include the industrial design in dependent countries; social forces that determine the shape of technology; role of the designer in disaster relief; reduction of need by design; role of the artist in a hospital environment; and Lucas workers' initiative. The language of social action; twelve methodologies for design; and future of design education are also deliberated in this text. This publication is intended for professional and student designers aiming to gain knowledge on the extended and systematic study and development of design applications.